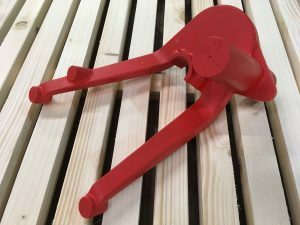 We have just had the pleasure of making the pattern equipment for a Rolls-Royce gear quadrant bracket for probably one of the most important Roll-Royce cars to be restored in recent history. The car is chassis number 2224 and is car number two, of three works racings cars built by Rolls-Royce for the 1913 Alpine Trials in Austria , which of course Rolls-Royce won decisively. The car was found in a dismantled state several years ago in a Belgian barn and is slowly being restored. The Gear Quadrant Bracket that we made is specific to these three cars and it was very fortunate that the original drawing for the component had survived in Rolls-Royce archives. Although we had a drawing to work from, this was so old, it all had to be converted to metric, it also didn’t include vital measurements. Obviously we had no one to ask for these measurements so had to calculate these ourselves, using the datum we had. 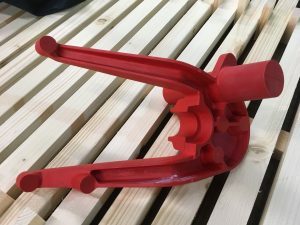 The drawing didn’t include any taper to ensure it would mould correctly, this had to be added and taken into consideration when making the equipment. 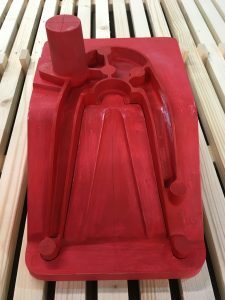 It is vital that the pattern is vertical to unsure it would mould correctly and the metal would run where it was intended. Therefore the pattern had to be built on an odd side and this had to be made 1st. Paul, our highly skilled traditional pattern maker, had to do many calculations using trigonometry and further calculations to take into account the contraction rates of steel to make the odd side correctly. Once this was made and double checked the Pattern equipment could be made. The drawing doesn’t tell us how to make the pattern, Paul had to think about the very delicate areas of the equipment which will be vulnerable to breakage, and had to use ways to strengthen these. Paul also had to include machining allowances on all areas that would be machined. Watch this space for pictures of the casting in the future and we hope to post a picture of finish restored Rolls Royce I’m sure it will be a real beauty.